Photograph depicts a large shelter over building believed to be power house. Electricity lines cross midground and run to power house. A man can be seen crossing the foreground by steel frame supplies, and a second building is partially visible on right. 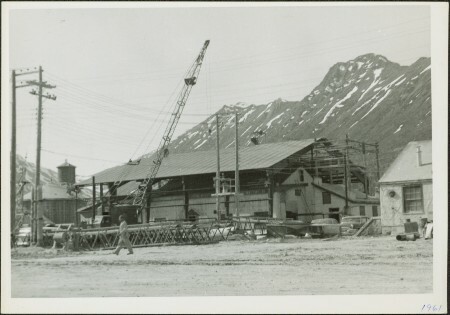 Mountains stand in background and a crane can be seen operating in front of power house. Handwritten annotation on verso of photograph: "1961".